The Viacom judging panel from left to right: Rose Hatcher, Viacom's Director of Supplier Diversity; Chris Gallucci, SVP, Chief Sourcing Officer; Lisa Dass, Sourcing Director (Corporate & Facility Services); Oliver Delgado, Sourcing Director (Research & Insights); and Rachel Roca, Sourcing Director (Production & Events). Photo by Robin Dillard, BEQ Magazine. Our final Certified Superstar of 2018 was hosted by Viacom on November 30, 2018. 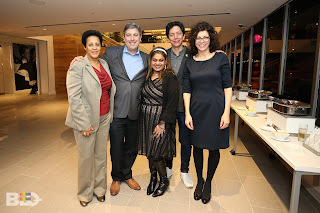 This was Viacom’s first time hosting the event for nglccNY. 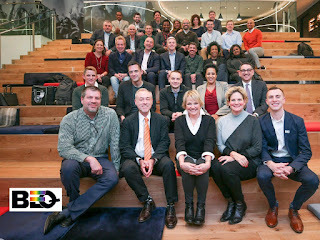 Looking out onto Broadway from the 31st floor of its Times Square building, suppliers, guests, and Viacom judges and representatives sat in Viacom’s gorgeous amphitheater to learn from four nglccNY LGBTBEs who pitched their businesses. In pitches that included high-end video presentations and chocolate samplings, Matt Skallerud of Pink Banana Media, Shana Scott and Amy Scott of mOdat Productions, James Wawrezewski of Ludlow6, and Ben Conard of Five North Chocolate educated us on their businesses, experiences, successes, and ideas of how Viacom might consider working with them. In exchange, they received critical feedback to assist them in fine-tuning and elevating their pitches which was also beneficial to those of us in the audience. Certified Superstar attendees watched the competition unfold. Photo by Robin Dillard, BEQ Magazine. Special thanks go to Rose Hatcher, Viacom’s Director, Supplier Diversity, for partnering with us and lining up an extraordinary panel of judges that included Chris Gallucci, SVP, Chief Sourcing Officer; Oliver Delgado, Sourcing Director (Research & Insights); Lisa Dass, Sourcing Director (Corporate & Facility Services); and Rachel Roca, Sourcing Director (Production & Events). After the four pitches, we were thrilled when Rose Hatcher announced that the judges were going to convene and select a winner who would be awarded a two-hour power lunch with Chris Gallucci to continue the mentoring experience. In the midst of the networking reception that followed the pitches, Chris caught us all off guard when he announced that the panel decided to award all four suppliers with power lunches! 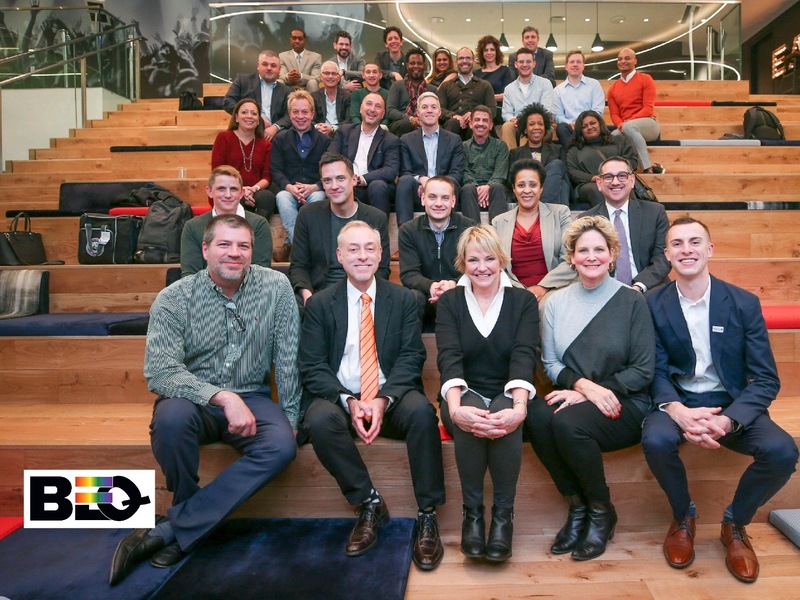 Each of the four LGBTBEs that pitched matched well with the four judges’ areas of sourcing and experience, making for a perfect fit to provide each one with the opportunity to continue the mentoring conversation. Congratulations to Pink Banana Media, mOdat Productions, Ludlow6, and Five North Chocolate for jobs well done! We encourage all LGBTBEs to participate in Certified Superstar and/or the nglccNY Biz Pitch in 2019! In the meantime, we hope to see you all at the 20018 final round of the nglccNY Biz Pitch on December 10, 2018 at 4:00 p.m. If you have questions about any Supplier Diversity program, please feel free contact nglccNY Supplier Diversity Chair Rob Finkelstein at rob@nglccny.org.